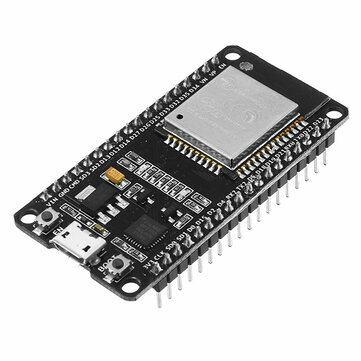 The ESP32 WiFi/Bluetooth microcontroller can be programmed using the Arduino IDE. Installing support for the chip into the IDE used to be a bit complicated and time consuming. As it was a manual process, you needed to repeat it every time you wanted to update the core. With the latest release (1.0.0, july 2018) things became much easier. Now you can install the core into the Arduino IDE using the built-in boards manager. The boards manager will also prompt you when an update is available and install the update for you. Start the Arduino IDE and open Preferences window by clicking File > Preferences. And enter this URL: https://dl.espressif.com/dl/package_esp32_index.json into the “Additional Board Manager URLs” field. You can add multiple URLs, separating them with commas. Open Boards Manager from Tools > Board > Board Manager menu and install esp32 platform. Select your ESP32 board from Tools > Board menu. If you’re not sure which one to choose, select the “Dev Module”. You can now test your module by uploading one of the example sketches by clicking File > Examples and scrolling to the “Examples for ESP32 Dev Module” section. If you want install the Arduino core for the ESP8266, this chip’s predecessor, then you should take a look here: ESP8266 NodeMcu and Arduino IDE on Linux. You will find that the procedure is now the same, for both chipes, and on Windows and Linux.